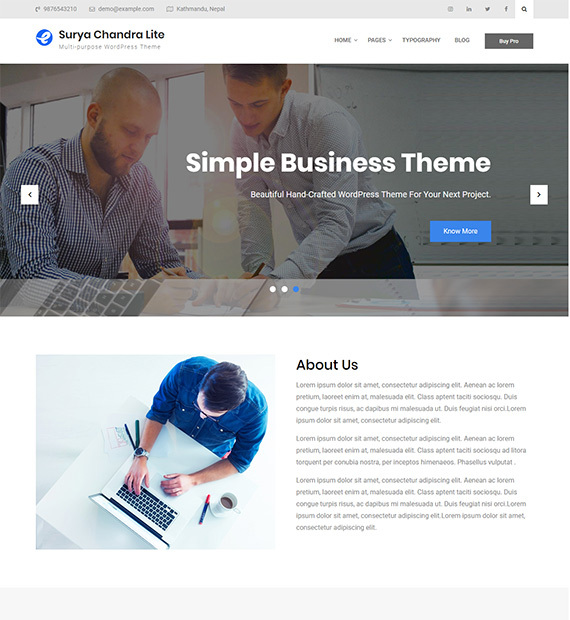 Surya Chandra Lite : Free Multipurpose WordPress Theme - Beautiful Themes! Surya Chandra Lite is a fully responsive multipurpose WordPress theme. It is perfect for the agency, business, corporate, or portfolio to build websites. This theme is fully customizable where you can customize the website the way you like with live preview. It includes one-click demo import so design your site just like the demo easily. The theme is fully WooCommerce compatible so do an online business perfectly. It includes multiple widgets that help you to create custom layouts with less efforts. Fully compatible with the Font Awesome Icon plugin that lets you integrate ingenious icons throughout your WordPress website. Be as creative as you wish!